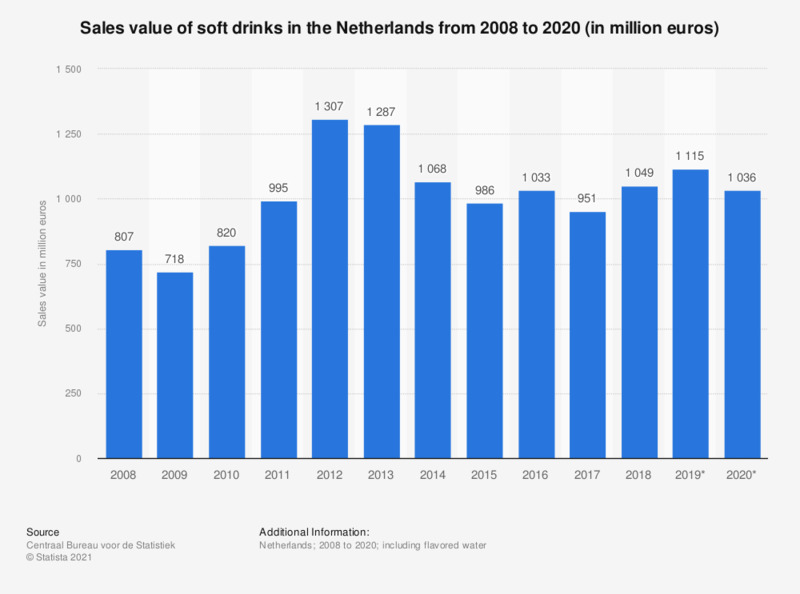 This statistic displays the sales value of soft drinks in the Netherlands from 2008 to 2017 (in million euros). In 2008, the sales value of soft drinks was approximately 810 million euros. The next year, this decreased to roughly 720 million euros, the lowest value in this nine-year period. By 2016, the sales value of soft drinks in the Netherlands was approximately one billion euros, but the next year it fell again to just over 950 million euros. Soft drink sales were highest in 2012, at roughly 1.3 billion euros. Statistics on "Soft drinks market in the Netherlands"